New opportunities are springing up in insurance, analytics and data. Should you focus on your immediate sales opportunities, build out your product and ramp up your marketing communications? Pursuing too many options at once creates conflicting demands, unclear priorities, lost opportunities and wasted time. 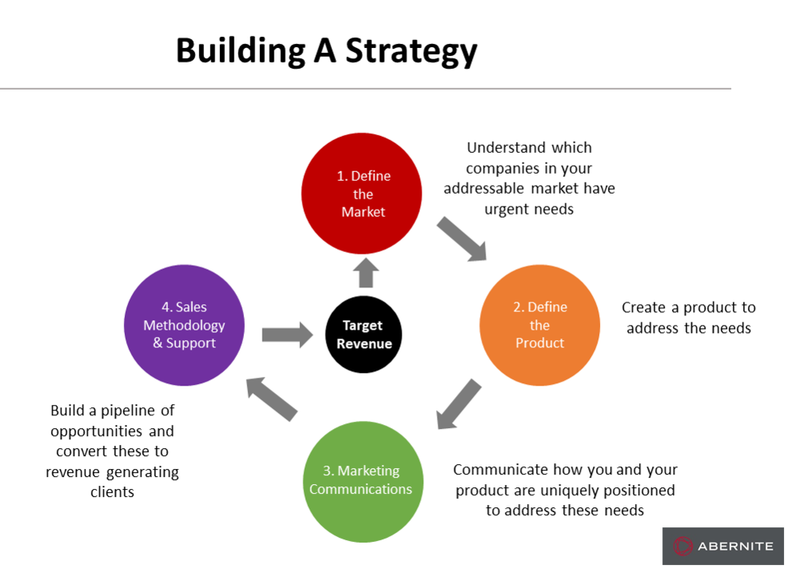 Strategic planning builds on our four core elements: define the market, define the product, communicate and sell. It's likely we need to do some work in at least a couple of these areas to create a baseline of market need, prospective clients and approach to selling. A well crafted strategy identifies the key priorities for the business aligned with 1 - 3 year goals. We work with you and your team to perform a diagnosis, formulate a set of hypothesis, develop a guiding policy and a finally build a set of agreed and coherent actions. The first element of work is to define the market. Here we clarify the market segments that best fit your solutions and identify your prospective client companies. We identify the relevant needs and challenges in these markets, the ones that will cause your clients to buy your products. We can help assess your competitors, both external and internal to your prospective clients. Finally, we will establish how people will use and buy your product and define your buyer personas. The second element of work is to define your products. Together we will establish your portfolio of products and clarify how each of these solves your clients needs. We will look for specific use cases to bring your products to life. We will help identify new opportunities to enhance existing products or build new ones. The potential exists to apply the latest techniques for rapid innovation and deployment. The third element is a review and develop your marketing communication plans. We'll examine your explicit core competencies; what makes you different from your competitors. Then we establish what you need to say and how to say it. Finally we'll work together to build actionable marketing plans to deliver focused messages to your future clients. The fourth and final element is to build a robust sales plan, and ensure you have a healthy pipeline of sales. Building on the work we have done in the market assessment we will identify your most attractive prospect companies. We'll provide a simple, actionable account planning process, with access to key data around your target markets. We'll help you create a robust, repeatable sales process and build an effective sales team. Finally, where appropriate we will establish introductions for you with potential business partners and clients. Priorities will be aligned between short term revenue generation, investments in products and marketing, often referred to as the three horizons of growth. Horizon one is your core business, providing short term profit and cash flow. Focused on improving performance to maximize the current value. Horizon two relates to your emerging opportunities. These could generate substantial profits in the future but need to be cultivated now. Horizon three is about managing the ideas that will be needed to sustain the pace of growth further out in the future. Some should be monitored, others may need selective, small engagements to cultivate the opportunities as they evolve.